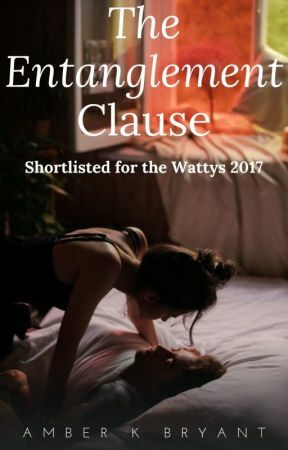 THE ENTANGLEMENT CLAUSE fans! I have been so busy and I want to first apologize for all of the comments that have gone unanswered. Please know that I value each and every one of you and am so grateful that you would take the time to read this story or anything that I&apos;ve written. Even if I haven&apos;t had a chance to communicate with you individually, I don&apos;t take your readership for granted and I thank you for taking the time to read and reach out. TEC made it to the Wattys 2017 Short List! Hooray! Off Wattpad, I am working on extensive alterations to this story--not because I don&apos;t like it as is, but because I have been given advice from a very good agent and want to follow it. This agent has been so kind, and she LOVES this story. I know that I can take it in a fabulous direction thanks to her and thanks to all of you and your support as well! I have a lot of work on Wattpad&apos;s Tap app, so if you are looking for short works, do check out that app and find me there (I&apos;m amberkbryant on Tap). Thank you again for being fabulous and supportive people. Much LOVE to you all!